Haechun Corporation Emerges As S. Korea's Leading "Total Submarine Solution Provider"
Haechun Chairman Kim Young-il (center) poses with Mr. Hans Rijntalder (2nd from right) and with others at the signing ceremony held at his head office in Busan, South Korea on Sept. 16, 2015. At right is Haechun President Sohn Woo-Taek. South Korea’s leading submarine solutions company "Haechun" Corporation has recently signed a memorandum of understanding (MOU) with Wind Minds, global offshore wind consultancy of the Netherlands, for cooperation on offshore project with a focus on Asia and Europe, Busan-based Haechun announced recently. 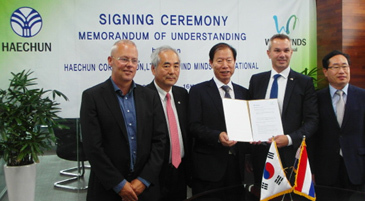 The MOU was signed on Sept. 16 (Wednesday), 2015 by Haechun Chairman Kim Young-il and by Mr. Hans Rijntalder, co-founder of Wind Minds and its Korea country manager at the Haechun head office in Busan, South Korea. The signing ceremony was joined by other dignitaries including Haechun President Sohn Woo-Taek, Senior Commercial Officer Kim Man-Seok of the Dutch Embassy in Seoul, and Mr. Frans Q.J. Kortekaas, an advisor of a Dutch business agency. According to the MOU, Haechun will join hands with the Dutch company to investigate cooperation opportunities in the field of offshore wind farm development, installation as well as its operation and maintenance. "Haechun is eager to cooperate with Wind Minds in offshore wind as the two companies are very complementary," said Chairman Kim of Haechun Corp. "We expect to move quickly based on the market targets we have defined"
On the part of Wind Minds Mr. Hans Rijntalder also made a lengthy comment about the signing of the MOU between the two leading companies in the sector of offshore wind development. "Korea is one of our core markets and I’m delighted that we signed the MOU today," Mr. Rijntalder said. "The Dutch Embassy in South Korea provided excellent assistance to make this happen and witnessed the signing ceremony"
"Haechun brings valuable first-hand experience in offshore wind turbine and submarine cable installation in the East China Sea, an area earmarked for substantial renewable energy growth for South Korea," he went on. "We will bring our extensive international experience in developing offshore wind farms and a strong ambition to continue to grow our presence in the Asian market," he added. "Together we will explore the market opportunities in offshore wind in Asia and Europe"
Haechun Corporation, based in Busan, the second largest city in South Korea, is South Korea's leading company in the field of submarine power cable and wind farm construction. Established in 1987 by its founder and the current Chairman Kim Young-Il, Haechun has conducted numerous underwater constructions including electric cable ones. Haechun has also dealt with a variety of constructions of submarine structure through its state-of-the-art technology, becoming a vanguard in South Korea in this area. Among its nation's first construction projects were the projects of KEPCO's "154KV AC high-voltage underwater cable 2 circuits" installed between Anjwa area and Hwawon island and "construction of KEPCO 2MW Offshore wind farm at Woljeong in Jeju." A myriad of other projects have been successfully conducted by Haechun, which earned this pioneering South Korean company both domestic and international awards. Under its corporate principle of "Smart, Speed, and Synergy" Haechun is proud of becoming South Korea's leading "Total Submarine Solution Provider." Wind Minds, global offshore wind consultancy of the Netherlands, was established in 2014 by bringing together four independent consultancies. Each consultancy has over 15 years’ experience in the renewable energy industry. While its domestic market based in Europe, Wind Minds is increasing its international presence in East Asia including China, Taiwan, and South Korea. exploiting offshore renewable energy resources with the help of its highly experienced team of over 100 engineers and consultants. They have worked on over 28 GW of renewable energy projects worldwide.